Thuja Green Giant has become the most popular choice for evergreen hedges across most of the county. Everyone is using this fast-growing tree to build beautiful hedges for privacy and as the perfect background for their gardens. This plant so popular because of its fast growth rate, and such a tough plant will thrive and grow well in lots of different situations. It is a living thing, though, and it performs best with a little help from us. Here are some simple tips will make sure that your Thuja Green Giant Hedge grows at its fastest rate, soon maturing into the perfect hedge you are looking for. Making sure your plants have everything they need when you plant them is the first place to start. Once you have decided where your hedge is to run, prepare the ground by digging it as deeply as you can. For a smaller area you can hand-dig to the depth of a full-sized spade. For longer distances using a rototiller is a good idea, and will make the job so much easier to do. The bigger the machine the better, and it is easy to rent a full-sized professional machine for a day, and do a great job. You also want to have some organic material to add to the soil. This can be almost anything, from garden compost to peat moss, but the richer the material the better. Spread several inches of organic material over the area for the hedge, to a width of three feet. If the area is already lawn, cut it short and dig or till the grass into the soil. It will rot and add nutrients for your hedge. If it is rough ground, go over it first with a spade and dig up any large weeds, removing the roots as much as you can. The secret with rototilling is to take your time. Go over the ground as slowly as possible, using the lowest speed for the machine, and allowing it to dig itself into the ground and move forward slowly. Till the area two or even three times, until the tiller is as deep as it can go. Till a strip three feet wide, and when you are done, rake it level, removing any weeds. The temptation to pack your plants very close together is understandable, but a big mistake. You need to allow enough room for the plants to develop, and spread sideways to make what will become the bottom of your hedge. If you pack them close together there is a danger that in a few years the lower part will become thin and open, so you never build a thick, strong hedge right to the ground. The minimum spacing should be 3 feet apart – Thuja Green Giant is so quick growing that it will very soon fill that gap. For a tall hedge or a natural screen you can even go wider, 4 or 5 feet, and for a very dense screen a double row, with the plants staggered, is even better. At planting time, water the pots thoroughly the night before, because you never want to plant dry root balls. If there are roots circling around inside the wall of the pot, cut through them in a couple of places to encourage the roots to spread out and find that rich organic material you added. Don’t wait to water your plants until after you have put back all the soil. Do it when about two-thirds of the soil has gone back. Then add the final layer of soil. That way you have made sure the water is well down in the planting hole, and not just on the surface. To get the best start with your hedge, a regular watering and fertilizing program is important. In the first growing season, water your plants once a week, and twice a week during hot weather. Running a trickle hose along the row and connecting it to a tap is the easiest way to really soak your hedge without taking up much of your valuable time. For the quickest growth in that first season, water-soluble fertilizer gives the best results. This soaks right down into the root zone, and it is quickly absorbed and used by the trees. Look for a blend made for evergreen hedges and follow the directions. Normally these kinds of fertilizers are used every two to four weeks. Make sure you follow the dilution directions carefully, as too much is not a good thing. If you have planted a large hedge, a hose attachment for putting down the fertilizer will save you a lot of time. Once your hedge is established, switch to a granular fertilizer program. These are usually applied in early spring and again in mid-summer, but some modern types are slow-release and only need one application a year. Alternatively, you can continue with water-soluble feeding during the second year as well, which should give you a slightly better growth rate. After that granular fertilizer work just fine and save time too. Continue to water during dry-spells, as a good water supply is needed for maximum growth, but allow some drying of the soil between each watering. Water thoroughly at intervals, rather than small amounts all the time. Don’t let the soil around the roots dry out completely, especially during the early years. Established plants are very drought-resistant, but they won’t be growing when the soil is dry – just staying alive. Even though Thuja Green Giant is a naturally fast-growing plant, a little care will give you the quickest and best results possible. Like raising children, care in the early years makes for strength and health in the later ones. Your soil is the foundation of your garden, and the support for everything that grows in it. This means that no matter what you plant, considering your soil is always going to be step one. Thuja Green Giant is often among the first plants bought for the garden, since hedges and screens made from fast-growing plants are the first step in building privacy, protection and a sheltered environment for more demanding plants. Fortunately, Thuja Green Giant is a plant that is very tolerant of a wide range of soil conditions, so most gardens can accommodate it without problems developing. Even so, since this is vital information for all your later plant choices, this early stage is a good moment to check out your soil and collect some basic information. There are two important aspects to soil that you need to know, and both are easy to find out. The first one is your soil texture. This is how fine or coarse the particles in your soil are, and it is what is meant when we talk about sandy or clay soils. There is a simple way, with no tools required, to find the texture of your soil, and it is one of the first things to do when you start working with your garden. 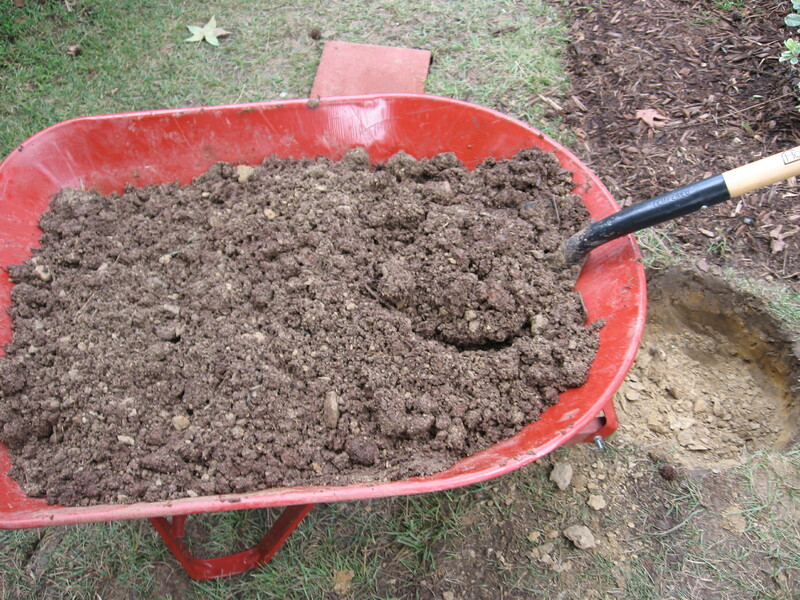 First, scoop up some soil from a few spots in your garden, and mix it together. Then take a couple of teaspoons of that soil, and place it in the palm of your hand. Add a few drops of water, and mix until the soil stick together and feels like Play Doh. Now make a ball and squeeze it in your hand. When you open your hand, is it still in a tight ball? If not, and it is falling apart, then your soil is Sandy Soil. Now squeeze and push the ball of soil out of your palm over your first finger, into a ribbon. Do this until the ribbon breaks under its own weight. If the ribbon is only an inch long, then you have a Loam Soil. If the ribbon is between one and two inches long, you have a Clay Loam Soil. If the ribbon is longer than two inches, you have a Clay Soil. If the soil also feels gritty, no matter how long the ribbon, then you have a sandier version of these three types of soil, and one that will drain well, but perhaps need more frequent watering. The less gritty it is, the more clay there is in it, and the longer your soil will take to drain. The next important thing you need to know is the acid balance of your soil. You can easily test this with an inexpensive kit from your local garden center or hardware store. Acid balance is measured on a special scale called the pH scale, and 6.5 is the best number to have for most plants. If you have that, or a lower number, then you can grow acid-loving plants. Soil around the number 7 is called neutral, and above 7 is alkaline. What Soil Type does Thuja Green Giant Like? Fortunately, Thuja Green Giant is very adaptable and will grow well in all four main types of soil. In more sandy soils it is best to add lots or organic material when planting, and to water more frequently. Clay soil too benefits from organic material, since it opens up the soil and improves the drainage. If you have a clay soil, then only water when it begins to dry, as this kind of soil drains slowly. If you have the ideal soil – a loam type – then you are lucky, and you will have an easy garden to grow plants in, but even if your soil is sand or clay, Thuja Green Giant will do well if you put a little extra effort into preparing the soil. If you have a very sandy soil, then extra water and fertilizer will be needed to get the maximum growth from your plants. With the acid balance too, this is a plant that is happy in all types of soil, from acid to alkaline, so it will thrive, no matter what your soil type is. You will not have to try and modify it, although if your soil is very acidic, with a pH below 4.5, adding some garden lime to the soil when preparing the planting area will help release extra nutrients to encourage the maximum growth for your Green Giants. Even in very alkaline soils, over 7.5, this plant will thrive, unlike many other evergreens. The one thing you should pay attention to is drainage. Does water lie on the soil surface for more than a few hours after heavy rain? If it does, you have poorly-drained soil, and it is a good idea to plant your hedge on a ridge, by mounding up the soil in a row. This will lift the roots out of the wet soil, and keep them a little drier during the important establishment stage of growth. The information you gather about your soil will really help you make good choices for future garden plants, and help you plan watering and fertilizer applications. Whatever your soil, you can be sure that Thuja Green Giant is such a tough and reliable plant that it will flourish in all but the most adverse conditions. Just a little care will make all the difference. 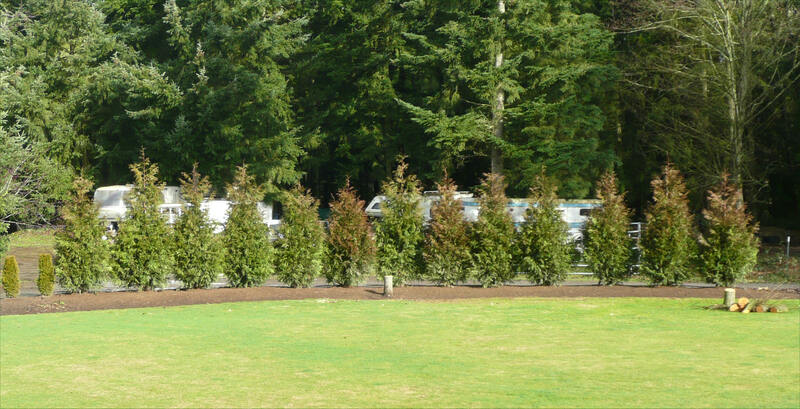 Thuja Green Giant is the most popular screening and hedging plant for a wide area of the country. It is so fast-growing that an attractive, durable screen or hedge can be created in a few short years. When planning to plant a screen or hedge, how far apart you are going to place your plants is the first decision you must make. Spacing depends on several factors, and it is going to have a big effect on how soon you have an effective screen, and how durable that screen is going to be. It is definitely worth putting some serious thinking and planning into this step, before purchasing your trees. The most common mistake made is putting the plants too close. This becomes more of a problem the taller you want your final screen or hedge to be. It is always tempting to go for an ‘instant hedge’ and pack the plants as closely as you can in the row. This might give a quick effect, and for a shorter hedge it can even work out OK, but it usually just creates future problems instead. One obvious problem is that by packing the root balls together, there is no room for future root development, so the plants become stunted and starved for food – meaning slower growth over the long term. The second problem is that plants naturally compete with each other for light, so by crowding them together they grow tall and skinny, and the lower branches quickly die, leaving your hedge bare and thin. A tall thin hedge is also much more likely to bend over or even break in a storm, strong winds or a blizzard. The thin stems just can’t hold up the branches once they are weighed down with water, ice or snow. That is that last thing you want to happen to your hedge, so you need to encourage sturdy growth, and to do that means allowing the plants more room. Grown as a single plant, Thuja Green Giant will be about 12 feet across in 12 years or so. That means that a screen even at that spacing will eventually form a solid barrier. Most of us don’t want to wait that long, so something closer makes sense. In trials that were done at the University of Arkansas, very small plants were 5 feet across in 7 years, meaning that the typical 4-foot or 5-foot tree bought for a screen or hedge will be that wide in just 2 or 3 years. So, if you space your plants 5 feet apart you will get the best combination of sturdiness and speed to complete your screen. If you have more time, or less money, then spacing between 5 and 10 feet wide will always give you a solid screen, some just take a little longer to get there. 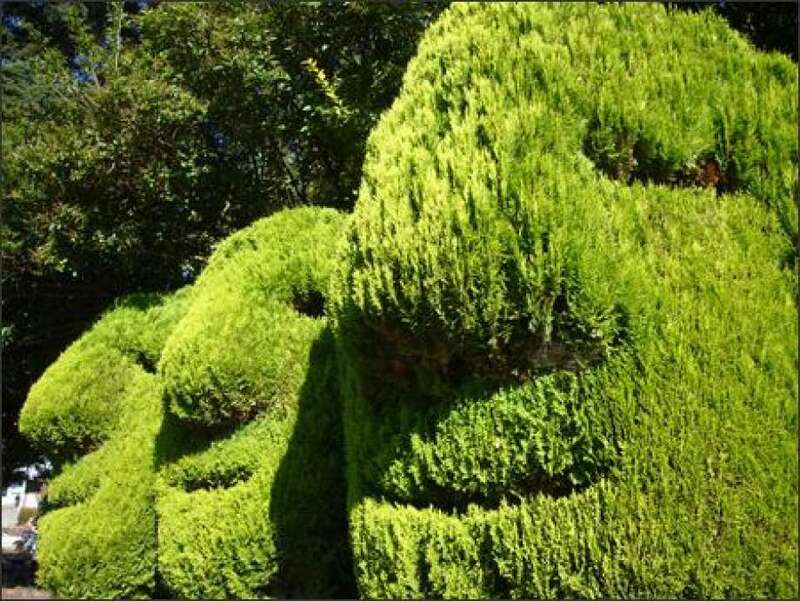 For hedges, closer spacing is best, because you want a denser surface to trim it into that beautiful solid, green hedge you are dreaming of. This means that for hedges, spacing your plants between 3 and 5 feet apart will give you perfect results in a very short time. The answer to this question depends on how solid you want the barrier to be, and how much space you have. Double spacing – where we plant two rows, not one, with the plants staggered in the rows to create a zigzag pattern – is the best way to get a really dense screen that will block wind, noise, dust and drifting snow. It will be wider, so you need more room, and it takes a few more plants. However, since the spacing in the rows is increased, it actually doesn’t take a whole lot more plants at all. For example, if you are planning a single row spaced 5 feet apart, then a double row, with the rows 3 feet apart, and the plants 8 feet apart in the rows, still gives you plants that are 5 feet apart on the diagonal. (Some quick school geometry with Pythagoras’ Theorem will prove that). This means that for a 150-foot screen, you need 30 plants with single spacing, and only 8 more for a double row. Those few extra plants will give you a really solid and dense screen just as quickly, and a superior result in the long-term. The first step is to measure out the length you want your hedge or screen to be. Then try dividing that length by 5 for a screen, or 3 for a hedge – how many plants is that? Let’s take an example. I want a hedge that is 123 feet long. If I divide that by 3 I find I need 41 plants. If I go with a wider spacing of 4 feet, that number comes down to 31 plants. Is the saving worth the slightly longer wait for that perfect hedge? Only you can answer that question. Once your plants arrive, and you are ready to plant – something we have looked at in other blogs here – it is important to place all your plants in their final location before beginning to plant. Put the first and last plants half your chosen planting distance from the place you want the hedge to end, and then place the plants in between. Adjust the positions so that every plant is evenly spaced BEFORE you start planting. Thinking about spacing in the planning stage, and making the right decision before you place your order, is time well-spent, and will give you the best possible result for your investment. Thuja Green Giant is a tough, adaptable plant, but it will give you its best if you help out with a little planning. You will soon have that screen or hedge you have been dreaming about. Thuja Green Giant is the most popular hedging plant in America, except in the coldest areas, where Emerald Green Arborvitae is a better and hardier choice. Although Green Giant is completely hardy throughout Zone 5 – that is, where winter minimums can reach minus 20 degrees Fahrenheit – if you do live where it is close to its minimum hardiness, there are some simple steps you can take to protect your plants from potential injury, especially if some exceptionally cold weather should come your way. These few simple steps will give you ‘top-up’ insurance on your plants, and make sure they come through the winter untouched, and looking as great as ever. Of course, if you are in a warmer area, these steps will be completely unnecessary, because this is a tough plant, adapted to grow well across a large part of the country, with no special care at all. It seems odd to suggest watering trees in late fall, when the temperatures fall, but for evergreens this is a vital time when water is very important. Especially following a dry summer and fall, the ground may not be fully saturated with water. This is especially true around the base of a hedge, where the thick foliage can prevent rain penetrating right down to the roots. When the ground freezes it becomes harder for trees to draw the water they need, and this can lead to problems. The foliage continues to lose water, especially when cold, dry winter winds blow, and if that water cannot be replaced, the foliage can wither and brown. Thuja Green Giant is normally resistant to this kind of burning, but it makes sense to take the little time needed, and give your hedge a good soak before the ground freezes hard for the winter. This is especially true for newly-planted trees, whose root-balls have only limited access to water, since the roots have not yet spread out. If the ground is saturated when it freezes, it will not freeze so hard or so deep, and the roots of your trees will still be able to get all the water they need, and brown foliage will never strike your plants. 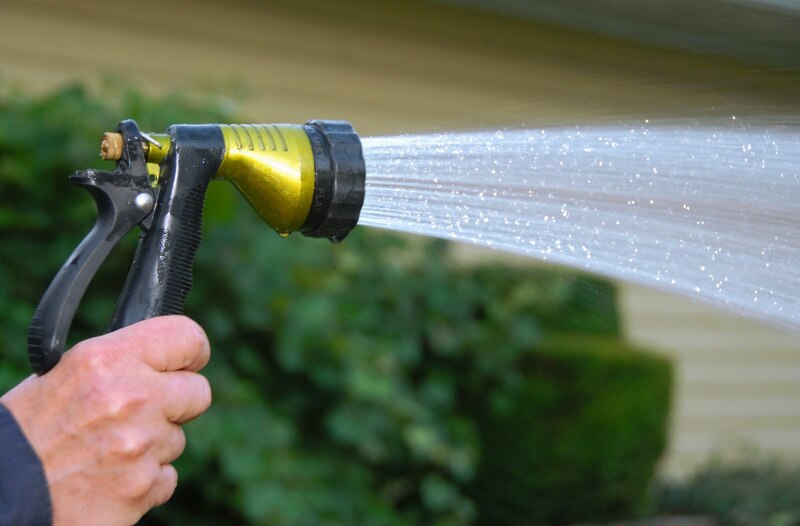 If you have a soaker hose in place for regular watering, this job is as easy as turning a tap on for a few hours. If you don’t have a hose in place, then moving a trickling hose along the hedge, leaving it in each spot for an hour or two, doesn’t take much effort either. A slow flow of water for a longer time will penetrate much deeper than a fast flow for a short time. The first winter in the ground is an important stage in the life of your Thuja Green Giant plants, and in cold areas a little extra care will be well rewarded. If your new hedge is in a position exposed to strong northerly winds, or along a highway, then a simple screen of burlap attached to poles will break that wind. Since the plants will still be smaller, a standard six-foot wide roll will be all you need. Leave about a foot between the screen and your plants, so that it does not freeze onto the plants. This simple method will give good protection from strong winds and keep your plants happy and healthy throughout the coldest weather. Do not wrap the plants completely, as they may become too warm inside, and start to grow too soon. Then, when you unwrap them, that new growth will be easily damaged by any late frost that may strike. Whether this is the first winter for your plants, or they are well established, a heavy snow fall can cause damage, even to such a tough plant as Thuja Green Giant. Young plants can be pushed over by a heavy blizzard, and if not correctly trimmed, hedges can break open. With new plants, removing snow that may have pushed them over is best done when it is fresh and soft. Just push away the worst of it and make sure your plants are back upright. With an established hedge, prevention comes from correct trimming. Keep the top of your hedge narrower than the base, both to keep the lower branches growing strongly, and to have less area on top where snow can build up. If you live in an area where heavy snow is normal in winter, a rounded top, rather than one cut flat, will shed snow more effectively. When you trim, run the trimmer down as well as up, so that the side branches are approximately horizontal, not growing upwards. Long, upward-facing branches can easily be pushed outwards, and break. If your side branches are horizontal, this can never happen and the heaviest falls will be shed by your sturdy hedge. If you have problems with your hedge in winter, consider applying a special winterizing fertilizer in fall. These contain the right balance of nutrients to strengthen the foliage, and make it more resistant to cold and freezing conditions. Your hedge will be a rich dark green all winter, and come into spring ready to burst into rapid growth. These extra nutrients applied at the right time can really make a difference in an extreme winter. Thuja Green Giant is a reliable and hardy plant across most of the country. If you live at the limits of its hardiness, these simple tips, that take just a little work to put into effect, will help you avoid any winter problems that may come along. How Much should I Water my Thuja Green Giant Hedge? When it comes to making a hedge, Thuja Green Giant is without doubt the top pick. With its vigorous growth it soon makes a thick, strong hedge, without needing a lot of care. There is one thing that new gardeners do want to know, and that is how much and when they should water their hedge, for maximum growth and good health. When you first put your plants in the ground, make sure you give them plenty of water. The best way to do this when planting is to only put back part of the soil around the roots, and then fill the hole right up with water. This will drain down into the root zone, so when you put the rest of the soil back you know there is plenty of water around the roots – where it counts. If you wait until all the soil is back before watering, you may only wet the top few inches, and you could be leaving the soil around the root ball dry. During the first few weeks your new plants have no roots growing into the soil, and they only take water from the root ball that was inside the pot before you planted them. They can easily dry out even if the surrounding soil is damp. It is important in those early days to soak plenty of water right up against the stems of your plants, so that it trickles down into that root ball. The surrounding soil should also be kept moist, to encourage roots to move out in search of water and food, but don’t neglect the root ball itself. Water at least once a week during the first growing season. If you are planting in fall or winter you may find the soil and the root balls remain damp, so you may not need to water so much, but during spring and summer your Thuja Green Giant plants will need plenty of water, so weekly watering is necessary. If the weather is very hot and dry, and your plants are in an exposed, sunny place, then more frequent watering, perhaps every two or three days, may be necessary. By the time the second growing season rolls around, your trees will have sent out roots into the surrounding soil. So now it is important to keep the soil further away from the stem moist. You want your trees to establish a wide root system, so they can access the food they need, and resist drought, so watering over a wider area is important. You may still need to do this weekly during the hottest weather, but now you can water less often, since the roots have spread further out. You will get maximum growth from your young plants if they are getting all the water they need, so don’t neglect watering them during those critical early years. After a few years, your Thuja Green Giant trees will be well established, and they will be drought resistant and independent. However, after fertilizing, or during long dry periods, a good deep soak will make sure your hedge stays lush and healthy. It is always better to soak the ground slowly for several hours, than it is to spray a lot of water in a short time. Don’t be fooled by a torrential thunderstorm either – most of that water runs away and never penetrates the ground at all. Getting out and watering can become a chore, but there are lots of labor saving ways to take care of it and free up your time for more exciting things. You don’t need to install a full irrigation system to water your hedge easily. There are several low-cost options available, and the best choice is black porous soaker hose. This comes in 50 or 100 foot lengths, and you need about 50% more than the length of your hedge, so a 50-foot hedge needs about 75 feet of hose. You can join sections together easily, but if you don’t have good water pressure you may find it better to have separate sections, that you can water one at a time. The ideal thing is to bury this pipe around the root zone when you plant the hedge, but it can also be laid on the surface of the soil at any time later. Snake it over the root balls and around the stems, which is why you need that extra length. One end has a fitting to attach it to a regular garden hose, and that in turn goes to your water tap. When you want to water, just turn on the tap and leave it running for a couple of hours, until the whole area around your hedge is thoroughly soaked. To eliminate the need to think about watering at all, add a simple controller to the tap, which you can program to come on at any interval you want, for as long as you want. You can even add a soil moisture sensor, so that your hedge only gets watered when necessary, and with a small solar cell attached you don’t even need to worry about batteries. Everything will be automatically taken care of, and your hedge will get the best care possible. Thuja Green Giant has a well-deserved reputation as one of the very best screening and hedging plants for your garden. Ideas for this plant shouldn’t stop there – it has so much more to offer, since it is also a great plant to use around the garden as part of your planting schemes. Its evergreen foliage means it is attractive in every season, its strong upright lines makes it a great accent plant, and its rapid growth and reliability makes it a real workhorse in building a great garden. Surrounding the house with plants is a great way to join your house and garden together. Plants against the walls protect you from heat and cold, reducing heating and cooling costs. They soften the hard outlines of architecture and create a flow of green from the walls right out into the garden. Although flowering plants are excellent around the house, evergreens give a look of permanence and longevity to your property, and should be used liberally in your foundation planting. Trees are not a good choice, because their root systems can damage foundations, but even large evergreens have relatively small roots, and can be planted close to walls without causing damage. Thuja Green Giant is the perfect choice for tall blank walls, since it has a good height without being very wide. It will grow up to the roof-line of a two-story home, but it won’t overshadow it, or become a danger during storms. Tuck one into a corner to create a curving line around the house – perfect for smaller plants to go in front. Plant one on either side of the front door to create columns of green to frame your entrance and create a real ‘presence’ to your entrance. During the holiday season, you can wrap them in lights for a true festive feel. Many people like to clip the plants around their home into more formal shapes – it is a good way to make a transition from the straight lines and right-angles of a building into the natural rounded shapes of most garden plants. You might choose a simple upright conical shape, or pyramids, flame shapes, large balls or even cubes or spirals. 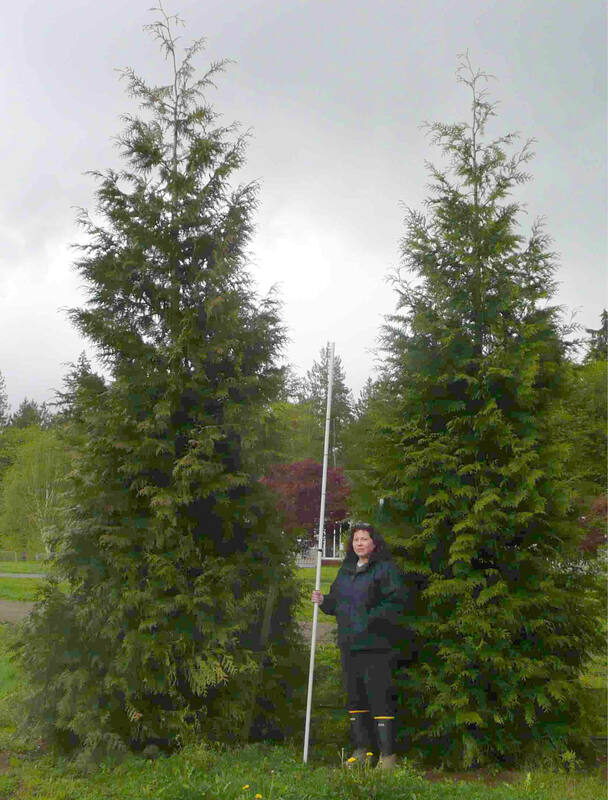 With its rapid growth rate, Thuja Green Giant will quickly grow to the size you want, and it is easy to clip, quickly developing the shape you are looking for. If you have plenty of room, try grouping three plants together and clipping them to three different heights to make an attractive grouping. Out in the main part of the garden there will often be awkward spots to deal with. These can be corners, where you don’t want something wide that will hang over neighboring properties, but that will fill the corner and perhaps hide a less-than-attractive feature. Thuja Green Giant has the potential height to hide that feature and make a bold statement, as well as the width to fill a blank corner without spreading widely and crowding out either neighbors or your own garden. In a large garden you want to fill space effectively, and often reduce the total area, so that your flower beds stand out more, and you garden needs less high-level maintenance. Well place groups of Green Giants in the back areas will do just that – creating a visual backdrop to your detailed work with flowering shrubs and plants. Perhaps the biggest single issue for beginner gardeners is understanding the final size of the plants the put into the garden. Thuja Green Giant is an upright plant, but it does need enough room for its width. So here is a useful way to check you are leaving enough room. Take a piece of string. Make a loop that will fit loosely around the pot. Measure out from the trunk about 4 feet along the string and tie a stick at that point. Now place your new tree on the ground where you would like it to be, and circle around it with the stick. The area you go around is the size of your tree at 8 feet wide, which is what it will be in about 10 years. Have you got enough room? If not, move it around a bit until you have it in a suitable spot. When you first plant the tree it may look like there is far too much space, but with such a fast growing tree you won’t have to wait long for that space to be filled with a terrific plant. So don’t limit your thinking about Thuja Green Giant to hedges and screens. This fast growing and vigorous tree is a great plant for your gardening too, and makes a bold statement wherever you plant it. Thuja Green Giant is certainly a fast-growing tree, and will grow happily in many different soil types. The natural rate of growth is influenced by the soil conditions it grows in, as well as the amount of light it receives, and these are not things that can be altered, but we can greatly influence the growth of this tree by using a fertilizer program, and selecting the best fertilizer to use. There are three main minerals needed by all plants to grow, and these are also needed by your Thuja Green Giant plants. The most important for evergreens is Nitrogen. This nutrient makes proteins, and especially chlorophyll, the green molecule that turns sun-light into plant, and gives your plants that healthy green glow. The second important nutrient is Phosphorus, which helps the tips of both roots and shoots develop and grow strongly. The third important nutrient is Potassium, which creates the pressure inside plant cells that holds the softer parts like leaves up in the air. It also makes thick cell walls that resist pests, diseases, and cold damage. Another important nutrient for your plants is Iron. These helps make those chlorophyll molecules and gives you plants a rich green color. It is especially important if you garden on lime soils. Almost all blended fertilizers contain some iron. All three of these nutrients are needed, but your Thuja plants especially need lots of nitrogen to make them grow fast, strong, and give them a healthy green color. On a packet of fertilizer you will find three numbers, looking like this: 15-19-5. The numbers will be different, and they don’t add up to 100, or any other particular number at all. The first number is nitrogen, the second is phosphorus and the third is potassium. For your Thuja Green Giant plants you need a fertilizer that has a high first number, and the other two should be equal or lower than that nitrogen number. Numbers like 10-8-6, or 15-5-10, or 20-20-20 are all good formulas to use. Most soils in North America have plenty of phosphorus (the second number) so that one is not important at all in making your choice – it can even be ‘0’. Especially in late summer and fall, a high third number (potassium) is good for winter protection in colder areas. To check if there is iron in the fertilizer, look for the letters ‘Fe’, which is the chemist’s abbreviation for that mineral. You will probably find a bunch of other nutrients in small quantities as well, and they all help the health of your plants. These are the kind where you add a few teaspoons to a watering can of water, or put them in a special mixer that fits on the end of your hosepipe. They are great for producing quick growth, especially in newly planted trees with small root zones, so they are a good choice for the first season or two. However, they have to be made dilute, so as not to burn the roots, so they don’t last long in the soil, and they need to be applied every few weeks. It makes sense after that first season to switch to another type that is easier to use. These look like fine gravel, often with grains of different colors, and they are either mixed into the soil when planting, or scattered over the surface around established plants. A great idea when planting is to use a fertilizer with a high middle number (phosphorus) to stimulate root growth in your young plants. This should be blended into the soil as you prepare the planting area. The nutrients will be released over a period of weeks, so you get slow and steady feeding for your plants. These also look like gravel, but normally they will all be the same color. Most of the fertilizers of this type are a blend of nutrients wrapped inside a coating material, which allows them to be released over a long period – often several months. They are usually more expensive, but since you only need one application a season they are great for a low-maintenance garden. These are fertilizer shaped into a spike which is gently hammered into the ground. They slowly dissolve and feed your trees. Be careful to follow the recommendations for the spacing and number to use, and always put them well away from the trunks of your plants. The best time to feed your plants is in early spring, just before the new growth begins. This is after the risk of hard frost is mostly gone and the days are becoming a little warmer – what month exactly will depend on where you live. Always follow the directions on the packet to know how much to use per plant or per square foot. Too much fertilizer is worse than none at all. Spread it evenly over the area beneath your trees, and include the area a couple of feet further out as well, which will be where the active, growing roots are. If you are using a water-soluble feed, apply plenty and let it soak down into all the root zone. Water-soluble solutions should be re-applied every three or four weeks throughout the growing season. 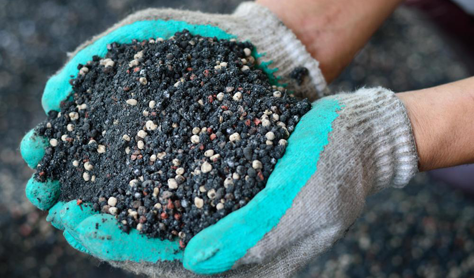 Granular fertilizers usually need re-applying in early summer and again in early fall. Slow-release formulations and spikes only need to be applied in spring. Avoid fertilizing your trees during hot, dry weather, or water them thoroughly after putting down fertilizer. It doesn’t matter much which kind of fertilizer you choose to use – it only affects the method and frequency of application. Whatever you choose, a good fertilizer program for your Thuja Green Giant trees will make sure you have the fastest-growing and healthiest plants around. Thuja Green Giant makes a perfect hedge – dense, upright and always green and healthy. It is fast growing, so you will soon have the screening and backdrop for your garden that you are looking for. Taking some simple steps in trimming it properly will help you grow a hedge that will not only look good, but will also be healthy, strong, and resistant to snow and storms. With a little care your hedge will always be green and dense right to the ground – just like you wanted it to be. The commonest mistake made with hedges is to wait until they reach the height you want and then start trimming. This approach will never give you a strong dense hedge, so instead you need to start early. As soon as your new plants are established – and you can tell that by the appearance of new growth – you should start trimming them very lightly. At first, you just need to go along the line and snip off an inch or two or the longer new shoots. This will encourage your plants to send out more side-shoots, and develop a denser pattern of growth. Allow the hedge to grow a little, and then trim lightly again. Gradually let it grow to the size you want, and it will already be neat and dense when it gets there. You can trim your hedge at most times of year, but the best times are late summer to early fall, or late spring, after the new growth has sprouted out and ripened. You may need to trim at both times if your hedge is young and growing vigorously. If you want a very neat hedge at all times, then you can also trim in summer, but do it before the hottest part of the year begins. If you live in a warm area with mild winters, then you can trim just about any time, although you should still avoid the heat of summer and the coldest part of winter. For green parts of plants to grow, they need sunshine and light. If the top of your hedge is wide, then the lower parts will get less light, and become woody and twiggy, with little or no green shoots. So right from the start you should slope the sides inwards by a few degrees so that the top is thinner than the bottom. Imagine that you laid a long pole against the hedge, leaning inwards slightly. All the shoots that stick above that pole need to be cut off, so that you have a flat surface that leans in by maybe five degrees. A common mistake is to make the sides vertical, and then just taper the last foot or two. This is wrong – the whole side should slope, right from the ground. If you grow your hedge in this way, it will have healthy green growth right to the ground for the longest possible time. 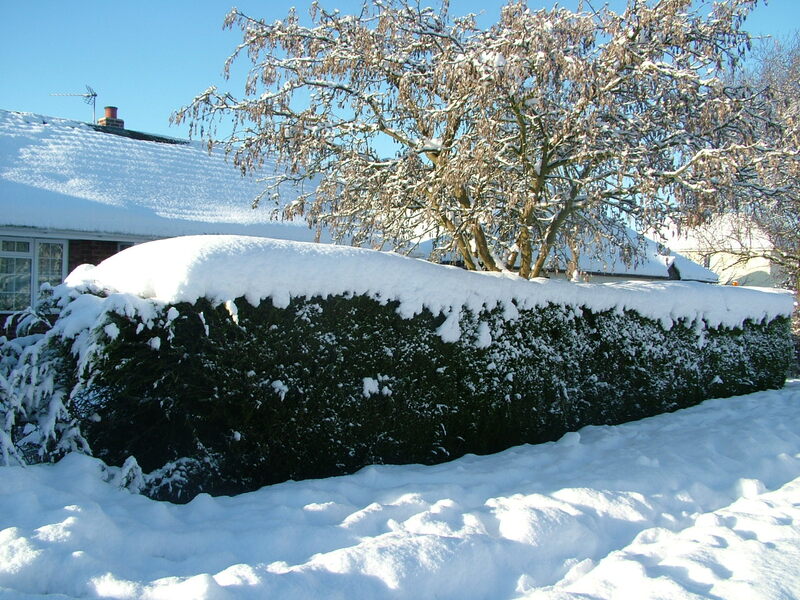 It also means that with a thinner top and with sloping sides snow and ice will fall off easily, not build up on the top and break the hedge. If you do this you not only keep your hedge healthy and green right to the ground, you protect it against snow breakage too. When you do the actual trimming, keep the shoots horizontal. This means stopping them from growing as long, upward shoots on the outside of the hedge. Aim for a brush-cut, not a comb-over! These long shoots can easily become dislodged, or break under snow, and if they break or die they can leave a large hole that will take a long time to fill back in. Trim from side to side and even down from top to bottom – not just up from bottom to top. This will prevent long shoots developing and give your hedge a dense, full surface. Start trimming at one end, and start trim from the bottom up. There will be less growth at the bottom to cut off, so that sets the base of the slope you are going to create. As you trim higher up, you will notice that to keep the slope even you are cutting off longer shoots and more of the hedge. This is normal and correct. The upper growth is always more vigorous and by removing more you will prevent it from drawing food and water away from the bottom. This, and letting the light in, is how you keep the bottom thick and healthy. If you planted your hedge along a path or driveway, you already have a line to follow to keep it level. If it doesn’t, then especially while you are training it, a tight string stretched from one end to the other along the ground makes a good guide for you to. Work steadily along, trimming all the way to the top in each section, but don’t trim the top flat yet. Once you have a nice even slope, and a flat surface all along the hedge you can think about the top. Thuja Green Giant can be trimmed square or rounded, it is your choice, but a rounded trim will shed snow better if you live in an area with heavy winter storms. 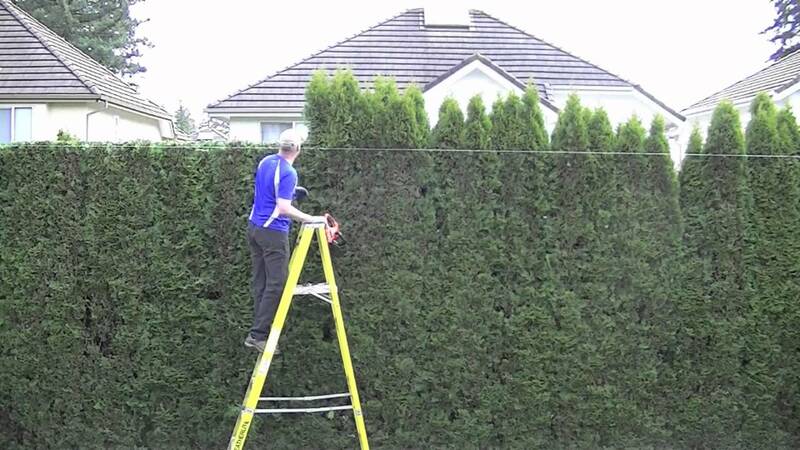 Use a long pole with a mark on it leaning against the hedge to show you the height, so that you get an even, level top – it looks so much better that way! It is important to realize that only stems with green growth on them will send out new shoots. Never cut into a branch so hard that it is just a bare stem. These will never sprout again. This is another reason to start trimming early in the life of your hedge, because If you let it become overgrown, it will be hard or even impossible to get it back to size, without leaving bare stumps that will never grow. So start trimming early in the life of your hedge, and trim regularly, at least once a year. This way you will have a neat, dense, healthy and beautiful hedge for many years to come. How Fast Will My Thuja Green Giant Grow? When you start a new garden, or update an older one, a critical feature is privacy – and exactly how to get it. Hedges and screens are a cheaper, longer lasting and much more attractive option than fences, but they do take a little time to develop. So when we put in a hedge or privacy screen, you want to choose something that will give you really fast growth, and this is where Thuja standishii x plicata ‘Green Giant’ stands out. This great evergreen is deer-proof, easy to grow, hardy across most of the country, and attractive every day of the year. As if that was not enough, it is also one of the fastest growing evergreens there is. Period. So just how fast will this tree grow? Three feet a year is normal in the early years. Up to five feet a year is possible, under ideal conditions. With growth rates like that, after a few short years you have 15 foot, 20 foot and soon 30 to 40 feet trees. The growth stays upright and narrow, so you get the height, but they won’t get too fat around, or crowd your garden. The actual growth rate you get also depends a little on you, since to get that maximum growth rate your trees need a good supply of nutrients and water. Choose a high quality plant food formulated for evergreens, and you are off to a good start. Choose a modern, slow-release fertilizer for the very best results, because they feed continuously, not in bursts. Follow the manufacturer’s directions and don’t put on more than recommended. Extra will do more harm than good. Water regularly, but let the soil dry a little between each watering. Always soak the soil completely, and water over a large area that covers all the roots, not just up against the trunk of your trees. Slow watering over a few hours is much better than putting on a lot in a few minutes. You don’t have to just take my word for it, scientific tests have been done that show just how fast this plant will grow. In the plant department at the University of Arkansas a few years back, they planting many different trees and shrubs in a trial to see how fast they would grow. The started with some very tiny plants given them by local nurseries, and planted them out in a field. They got a little fertilizer in the beginning, and some water during dry weather, but otherwise they were left alone. Each year the scientists measured the plants, and took notes. What they found was amazing. Thuja Green Giant outgrew every other plant in the field. It never got sick or harboured pests, and it always looked great. Seven years later, from a tiny little plant pushed into the ground, they had a monster ten feet tall – that’s right, almost twice as tall as a person, a big, green, giant of a plant that had grown faster and stronger than any other plant in that field. Now remember, they started with tiny plants maybe a foot tall. If you use good-sized plants that are already 5-6 feet tall, you will get even better results. Those plants have stronger roots and they will start growing even faster. So, if you add that 10 feet to the 5 you start with, and allow for the faster growth of older trees, your screen will be 15 feet tall in 5-6 years. That is truly remarkable, and unbeatable with an evergreen tree. Why Does this Tree Grow so Fast? Many people wonder why some trees grow faster than others, and the answer can be pretty interesting. Everyone knows about gene mutations and bad genes these days, and every living thing has them. They stop all the systems of life running at peak efficiency and limit what a plant can do. However, in plants, it is possible for two different species to cross-pollinate and make a hybrid, and that is how Thuja Green Giant was born. A seedling that grew by chance in a nursery in Denmark, it was the child of two different Thuja species, the Japanese Thuja and Western Redcedar. These come from opposite sides of the Pacific Ocean and had never met before. Both of them had some bad genes, but each had different bad genes, so when they crossed the cancelled out each other’s bad ones, making a plant that ran on all cylinders, at peak performance. Plant breeders call this hybrid vigor, and many of our food crops have it too. So this is why Thuja Green Giant is able to outgrow just about anything else in your garden. You really can’t find a better fast growing evergreen for perfect screens and hedges.